In the recent years, the scope of conservative dentistry with emphasis on esthetics has increased by leaps and bounds in enhancing individual personality. Composite resins are important for aesthetic restorations in dentistry, specifically in operative dentistry. But without bonding agents the success of composite restorations is minimized. Researchers are constantly endeavoring to improve the quality of bonding agents. The advent of new bonding systems which are capable of bonding both enamel & dentin has opened new avenues in the field of restorative dentistry. With the market floating with new bonding agents claiming superior bonding properties, this study was undertaken to investigate the degree of bond strength produced by three commercially available bonding agents (Syntac, Scotchbond 1, & Clearfil SE) with composite resin (Esthet-X) taken for the experimental procedure. Langerhan's histiocytosis was formerly known as histiocytosis X and refers to a group of conditions characterized by the uncontrolled stimulation and proliferation of a normal antigen-processing cell, the Langerhan's cell. Mandibular involvement associated with LCH is uncommon in a young child. Most reports describing bone involvements in LCH have mainly referred to male subjects over 20 years of age. The purpose of this report is to describe a case of multifocal bony LCH with mandibular involvement in a 8 year old girl and to discuss the appropriate management of such a case. In the field of radiodiagnosis shadows often raise doubts. On these depend the invasive investigative procedures which lead to the final diagnosis. The radiologist's word is often considered as the last word in labeling a lesion. The treatment protocol which follows makes a world of a difference to the patient. We report interesting cases where the patients were radiographed prior to orthodontic treatment and coincidentally we found-un believable hidden treasure! This is a modest attempt to emphasize that each shadow in a radiograph should be scrutinized. Needless to say, the keen observation and experience of the diagnostician is of penultimate importance in deciphering the abnormal from the normal. Modern management of caries stresses on non-invasive techniques wherever possible with maximum protection of sound tooth structure. Various dyes provide a highly contrasting visual clue by staining only infected dentin, thus clearly demarcating it from the affected normal dentin. Utilizing this property of preferential staining of the "Caries Detector" the current study was carried out to evaluate the relative concentration of bacteria in 1% Acid Red 52-stainable and non-stainable dentin. Sample of ten carious permanent molars or premolars in individual patient's mouth and carious teeth extracted due to periodontal diseases were examined for the two parts of the clinical study. Each clinical aspect was later subjected to laboratory procedure. Cariously infected dentin delineated by the solution, "Caries Detector" (1% Acid Red 52 solution in propylene glycol) contained six times more CFU/ml than dentin that did not take up dye. A case of 4 a year old girl with the complaint of delayed eruption of teeth is presented. She had moderate to severe, diffuse gingival enlargement in the maxilla and mandible. No deciduous teeth had erupted even at the age of five years except for incisal edges of upper, and lower anterior teeth. The diagnosis was made based on clinical examination and after ruling out drug and family history. Surgical removal of the hyperplastic tissue was done under general anesthesia. A natal tooth is that which is present in the oral cavity at the time of birth. Fibrous hyperplasia is a non-specific reactive lesion of soft tissues of unknown etiology usually associated with trauma or local irritation. Natal teeth can occur as an isolated dental finding, but many times they are associated wilh syndromes and developmental disturbances. This is a rare case, where in a natal tooth has led to the formation of a reactive fibrous hyperplasia in a four and half month old infant, a relationship not reported previously. Three Linear methods of establishing the sagittal relationship of the maxillary and mandibular apical bases were compared using Lateral skull radiographs of thirty individuals having Class II div. 1 malocclusion. Statistical evaluation was done for wit appraisal, AD' distance, and Wylie analysis. The A-D' distance is recommended for use during sagittal apical base relationship. Taurodontism has a very low incidence in deciduous dentition and very few cases are reported in the literature, it stands a challenge when it requires pulp therapy. This case report presents a case of Taurodontism in deciduous molars of a five year old male child which required pulp therapy. A clinical and radiographic follow up of the patient is discussed. Dilaceration of teeth can occur as a result of trauma to its primary predecessors. Root dilaceration is more common than dilaceration of the crown. 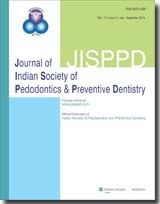 A rare case of crown dilaceration of maxillary permanent central incisor has been reported in this article. The present study was conducted to evaluate the comparative levels of cariostatic and caries potentiating trace elements and to detect residual coliform bacteria in six different bottled waters. Trace elements and fluoride were estimated using Inductively Coupled Plasma Optical Emission Spectrometer and fluoride ion electrode respectively. Coliform bacteria were detected by multiple tube method. It was found that, trace elements were below the significant caries potentiating or cariostatic levels and none of the samples showed coliform bacterial growth. It can be concluded from the present study that these water samples can be safely consumed without any dental ill effects.